Sleep in a unique design hotel with a view of the cathedral of Antwerp. Sleep with a unique view of theCathedral of Our Lady? It’s possible! 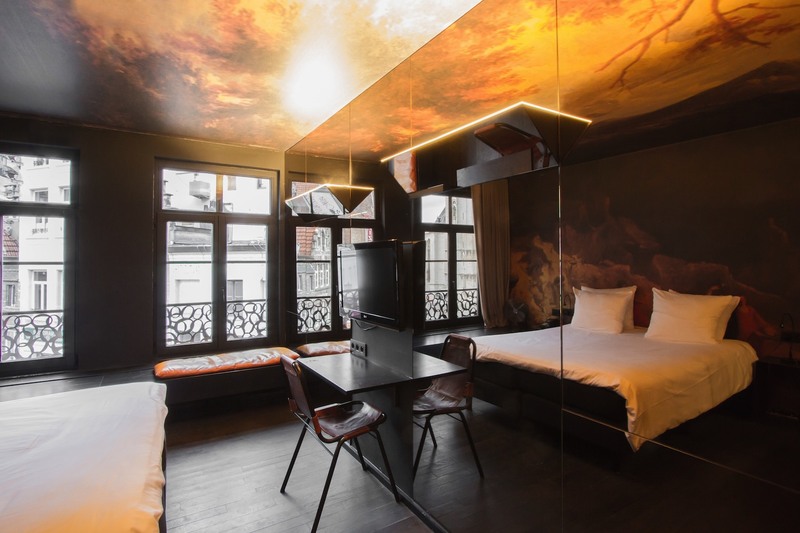 Hotel O Kathedral is located in the heart of Antwerp’s historic center within walking distance of the main sights, museums, bars, restaurants, shopping streets and the Schelde. The hotel features 33 comfortable and modernly furnished rooms with designer furniture, open bathroom and hardwood floors. Our romantic rooms all have a view of the cathedral of Antwerp and have a wall painting inspired by Rubens integrated in wall and ceiling. This gives you the unique feeling of sleeping in a painting. There is also a bar in the hotel and an in-house chocolate shop and coffee shop. WIFI is free and most rooms have air conditioning that can be arranged at your own request. Hotel O Kathedral serves a daily continental buffet breakfast with fresh and seasonal ingredients and home-made pastries, granola, salads and more.